For those who have never actually been to Japan, the idea that Japan's generally regimented, polite, and clean society could have a completely out of control and dangerous youth subculture is hard to believe. Residents of Japan know better. Enter: bosozoku. Or rather exit, as bosozoku are in steep decline. To say the bosozoku are "annoying" is something of a rather extreme understatement. They drive up and down the streets of both major metropolitan areas and smaller cities revving motors, honking horns, swerving in and out of traffic, swinging tubular weapons, yelling at pedestrians and motorists, damaging property, and essentially being a menace to anyone and everyone they encounter. Although the Japanese government is reporting that the strength of bosozoku groups have rapidly declined, I still find myself picking up my phone and calling my local koban (or police box) to let them know one of our local gangs is tearing up the grounds of the central park near my townhouse apartment. Even if bosozoku are in decline, who are they, and where did they come from? Japan's motorcycle gangs or bosozoku (which means "violent speed tribes" in English) aren't anything like American motorcycle gangs. Or at least, not anymore. Rather, like many aspects of Japanese society, the approach to the bosozoku culture seems to be "if ain't broke, don't fix it." This means that major elements of today's bosozoku still harken back to the glory days of post-WWII American teenage rebellion: pompadour hairstyles, greaser attire, impromptu weapons, and really obnoxious attitudes. Bosozoku members are typically between the ages of 16 and 20, the years in which you can ride a scooter or motorcycle, but not generally drive a car. They have never really been adult oriented groups like many American motorcycle gangs. Classic Honda motor cycle blog Honda400Four traces the roots of bosozoku back to the post-WWII period, specifically describing the melding of returning kamikaze pilots and other veterans who never went on missions but still likely suffered from some kind of traumatic stress disorder with the imported American greaser culture, especially movies like the one referenced in this article's headline, Rebel Without A Cause (1955). Bosozoku's roots date back to the post WWII years when a new societal problem group arised [sic]. Having lived under the war time rule and even an assumption of never returning home alive, such as the kamikaze pilots assigned for a mission that never came to be, some of the war veterans could not return to peaceful life without difficulties. The most extreme of these individuals started looking for new excitement by tuning cars and conducting less than desired, gang type activities on city streets. Inspiration and idols were found from foreign movies such as Rebel Without a Cause (1955). These ideologies later caught the motorcycle obsessed youth and bosozoku was born. The term bosozoku did not appear until the 1970s, when actual riots broke out between various biker groups and the police. It was not a term created by the subculture itself, although it was adopted after being coined. The riots created a media frenzy, and it was the media, in its social shock and moral outrage, who first christened the teenage motorcycle gangs bosozoku. Despite the attempts by the media to outrage the public and push the National Police Agency, bosozoku participation continued to climb. After the peak of bosozoku participation in the 1980s, the so-called "golden age" of bosozoku, members who reached adulthood would sometimes end up joining the yakuza, or Japan's system of organised crime. This is hardly surprising, since bosozoku are usually made up of the same youths the yakuza have traditionally looked to for recruitment. Historically, these youth have been from lower-income situations and broken or abusive homes. They are the "square pegs" in Japan's "round holes." And they are the "nails which stick out" and so have generally dealt with being repeatedly "hammered down." They represent, by their very existence, evidence of societal ills most in Japanese society would like to quietly pretend do not exist. Japanese photographer Yoshinaga Masayuki, who spent time following around members of bosozoku gangs for a photo collection, says the bosozoku themselves would argue their cultural value in different terms, portraying themselves as protectors of Japanese traditions which have been abandoned by mainstream society. In the sense of strict Japanese values, they are of course out of line, contrary to traditional Japanese simplicity. That's why, realistically they do not have any of those values... But in their own minds they are samurai with yamato-damashii. Most will understand what is meant by samurai (the world-known warrior class in pre-modern Japan), but how many will understand yamato-damashii? That term has no real direct English translation, certainly not one which is clearly understood in a Western context. It can be translated as "Japanese spirit" or "Japanese soul" but that really doesn't do the term justice. What it means in practical terms is that the bosozoku see themselves as roving bands of warriors representing their crews the way that daimyo (or Japanese fuedal lords) were represented by their samurai retainers. They see themselves as representing different groups which are yet still part of the unique Japanese whole. Bosozoku crews seamlessly meld this pre-Meiji Restoration (when the emperor regained political control) idea of samurai, with overt displays of post-Meiji radical ultranationalism (before and during WWII). Most obvious is the excessive use of the Japanese naval ensign, often considered the Japanese imperial flag or "rising sun flag." Its imagery can be found on uniform patches, bike helmets, crew flags, or even on the motorcycles themselves. The uniforms they wear are modified coveralls which are altered to resemble the uniforms worn by Japan's suicide-pilots, the kamikaze. In addition to the kamikaze being taught that they were the 20th century successor to the samurai, by the end of the war, they were also as young as 16, as Japan became increasing desperate. Put in a uniform, given a plane, and told to attack the enemy for their sacred honor and the honor of Japan, it isn't hard to see how the bosozoku have come to see themselves as successors in a defeated and occupied Japan. Two major reasons seem to explain the decline in bosozoku participation. Ironically, one of the biggest might be the worsening of the Japanese economy. While this would at first seem counter intuitive, as one would expect the economic effects of the prolonged recession and deflation such as falling wages, casualisation of work, higher unemployment, and increased taxes would lead to a burgeoning of a protest social class like the bosozoku. Instead, those now being actively recruited into the bosozoku crews most likely have substantially less money than their peers of the bubble economy. Bikes are expensive, and modifications even more so. Even the tokko-fuku, or uniforms of the bosozoku, are quite costly with their exquisite embroidery of kanji and imperial symbols. 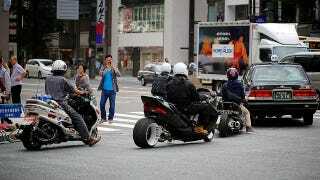 New recruits are now often wearing street clothes and riding cheap scooters, even the traditional rides and clothing of the bosozoku out of their economic reach. While I still see attempts at classic bosozoku style and flare, more often than not the bosozoku I am calling the cops on are of this newer, poorer segment. The second reason for the decline is likely the increased measures taken by the National Police Agency. At first glance, it would seem as though the police do absolutely nothing but follow the bosozoku around. I have never seen police really do much of anything to the bosozoku except drive them out of the immediate area. However, looks can be deceiving. When Jaime Morris produced the bosozoku documentary Sayonara Speed Tribes, the spokesman for the National Police Agency said that even he didn't believe the bosozoku were particularly frightened of the Japanese police. And that's likely because of the lore handed down from previous bosozoku leaders like Hazuki Kazuhiro, who rode in the 90s. Police would let you off easy before. No matter how many times you got arrested for reckless driving, they'd never strip you of your driver's license. The police spokesman told Morris a different story about the policing strategy. He said that new police vehicles currently have cameras in them, and so when you see the police following bikers without apparently doing much of anything, what's really happening is collecting enough evidence for identification purposes later. The general public doesn't see the arrests, because they happen after the police analyse the video and identify perpetrators. While it still didn't sound like arrested members of the bosozoku go to prison (which is a very, very good thing, because Japanese prisons are horrible and no place to put teenagers or really anyone for that matter convicted of small scale crimes), the spokesman did make it clear that convictions are extremely costly and negatively affect the driving record. The results of a worsening economy and stricter policing have led to the formation of quasi-legal bosozoku "alumni" groups called the kyushakai. These are groups which have adult members and reflect motoring groups found elsewhere in the world. Some of them still maintain their traditional bosozoku style and some of the traditions, but representatives of the groups generally deny being associated with illegal activity. One of the interesting aspects of the fall of bosozoku and the rise of kyushakai is the involvement of women. Often girlfriends of male bosozoku members at earlier times in their lives, these adult women are now becoming riders themselves. What will the future hold for bosozoku? I imagine the youth aspect of the subculture will most likely die out in the next ten to twenty years. It will be replaced by kyushakai, and new members of those groups will tend to be adults. As the kyushukai work their love of motoring into the social framework and the wider society stops connecting them to their bosozoku past, they will lose all credibility amongst disaffected youth. That will truly be the end of bosozoku. The rebels will become the establishment, if they haven't already. Images currently via Flickr. Videos via YouTube.